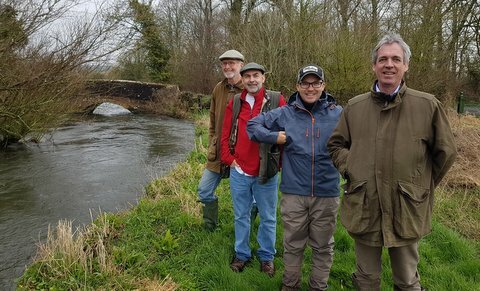 We had a great morning showing three new members the delights of the DFC waters, starting on the river Cerne, which is a great plan B if the main river is carrying extra water, then heading over to the main Frome. Starting at our upstream limit at Gasgoyne then leap frogging downstream (via the Wolfeton beat) to the lower water for another walk along the river. We then headed over to our Piddle beats for a look, Southover and Affpuddle. All the beats are very well topped up after our wet winter (please be careful wading) and the growth of Ranunculus looks very promising. I will be holding a pre season casting and tackle talk morning for members at 10am Friday 30th March here at the Dairy House West Stafford, please come along, coffee and cake provided!